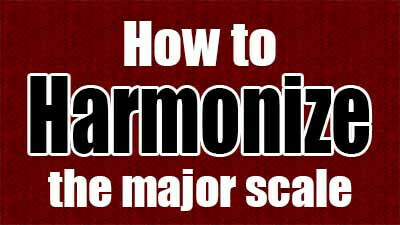 How to Harmonize The Major Scale ? In the first part of this lesson, we will build triad chords. Those chords are made of three notes stacked in thirds. Let's take the C major as the first approach, it is the one that everyone knows and there are no # or b in it. We will create a first chord starting from the first note of the C major scale (C). We just need to stack the third of C (E) and the third of E (G) with the root note (C). Here is our first triad, the C major chord (C-E-G). This chord includes a major third interval (C-E) and a minor third interval (E-G). In other words, this chord is formed starting on C, jumping D and taking E, jumping F and taking G of the C major scale. The second chord that we will build is a minor triad. It is made up by stacking thirds too. A minor third (F) and a major third (A) are stacked with the root note (D). As it starts from the note D, it is a D minor chord (D-F-A). If we do the same with the 5 other notes of the scale, we get 5 other chords. We obtain major and minor chords, with one exception: the degree VII stack 2 consecutive minor thirds, that gives a diminished triad. Here are the seven chords obtained after the harmonisation. There are 3 major chords (I-IV-V), three minor chords (II-III-VI) and one diminished (VII). Whatever the major scale used, the principle is the same. The first chord is major, the second is minor and on and on. Now we can harmonize the C major scale but with an extra note for each chord. 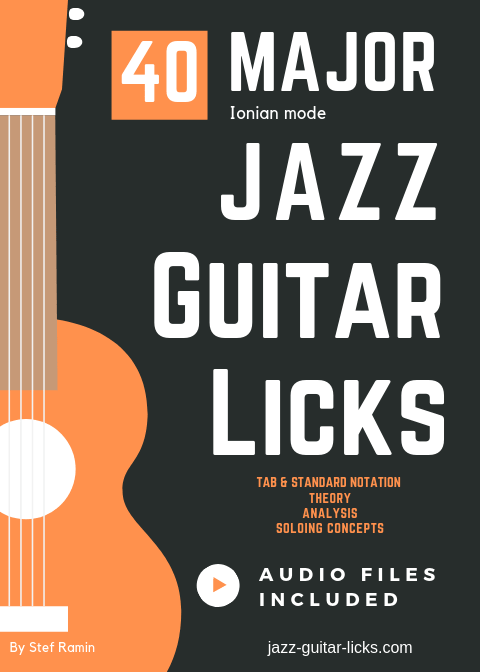 This way we will obtain four note chords known as seventh chords or tetrads. This is nothing but a triad with an extra note: the seventh. All these chords have a strong jazz sound, they are very used and so it is very important to understand and master them. We can of course, generalize this harmonization to any scale. The three neck diagrams show how to play the seven chords of the harmonized major scale on the guitar. The chord shapes used in these diagrams are drop 2 voicings, they are the most popular chords used in jazz music to comp, solo or build chord-melody arrangements. The interval pattern used for these chords is R-5-7-3 for the two major 7 chords, R-5-b7-b3 for the three minor chords, R-5-7-b3 for the dominant chord and R-b5-b7-b3 for the half-diminished chord. For clarity, each chord is represented by a specific colour. Now that you know how to harmonize the major scale, you have to be able to build any chord progression from any major scale. The most common is surely the II-V-I progression. It is simple, to build a II-V-I in the key of C just take the II (Dm7), the V (G7) and the I (Cmaj7) and you obtain Dm7 | G7 | Cmaj7. Lets built a II-V-I in the key of G. Chords will be Am7 (II), D7 (V) and Gmaj7 (I). You have to do this in the twelve keys.